So, what’d you guys do over Labor Day weekend? Mr. P and me, well... we decided to buy a sofa. Let me back up. Springing the news on you like that makes it sound like we impulse-bought a large piece of furniture to replace the sofa and armchair we sold before we moved. And that couldn’t be further from the truth! Behind the scenes here at the blog, I’ve been secretly researching for months. It’s been a bit of a roller coaster, so let me fill you in! First, recall that Mr. P hated the old sofa because he found it so horribly uncomfortable. So his number-one-criterion for a new couch was comfort. He wanted a sofa on which he and I could both curl up and watch TV with cushioned tushes. And while his stipulation was super practical, as he and I do spend a lot of hours on the sofa each evening, I was a little bummed to rule out a lot of the stylish, super-tailored, sophisticated, dare I say... frou-frou sofas that I adore. ... was sooooooo not in our budget. Although that Macy’s sofa was the right price, unfortunately it didn’t satisfy another urge I’d been developing, which you may have noted already... the urge for a sectional. Our living room is huge, and I wanted to find a lounge-worthy sectional to fill it up. But only if – and this is a tricky if – I could find a big sectional I liked that was within a sofa-sized budget. Which is darn near impossible! But there was one last consideration. And very, very important one. OH RIGHT THIRD-FLOOR WALKUP. Mr. P and I are strong, Mr. P and I are capable, but Mr. P and I are not moving a sofa up those stairs. And a sectional? Whooooo boy. It’s not just that we’d need to hire movers, though. Any sofa we purchase has to clear two important obstacles. 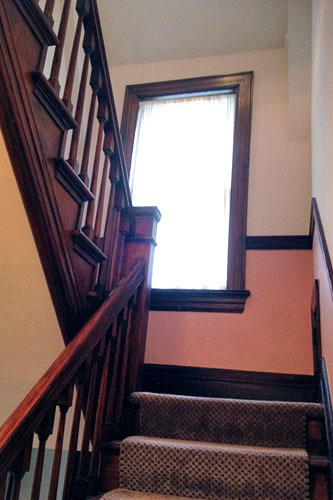 First, the distance between the window frame and the handrail on the landing is a mere 32”. And the widest door that leads into our living room is also only 32”. - that could be moved into to our third floor walkup. Do you see why it took us months to find our favorites that met all the criteria and finally, finally buy a sofa?! Really, who in blogland doesn’t have a white EKTORP sofa? I loved this sofa for a variety of reasons. For one: DREAM WHITE SOFA, you guys! And the white slipcover was machine washable, so when (when!) I smudged chocolate ice cream on it, or Mr. P dropped one of his many ink pens for grading, I could bleach the stain into oblivion. The reviews said so (this one in particular is great)! I also loved that it didn’t have a “sidedness”. Do you know what I mean? Because it’s symmetric, it would work in our current room, as well as any future room – just rotate it ninety degrees. And of course, the price – under a thousand smackers at $949. It’s sectional! It’s a sofa with a chaise! It’s both! Honestly, I personally liked the coziness of the 2+2 more; having “two backs” in the L-shape is my fave. But, the open chaise on this guy was Mr. P’s preference – which is important, because he wasn’t in love with the white slipcover like I was. Compromise is the name of the game at Casa P.
Still, this one has it has all the same pros as the other sofa – machine-washable slipcover, symmetric (the chaise can be attached on the left or right), and the price is so, so right at $600! I repeat: SIX HUNDRED DOLLARS. 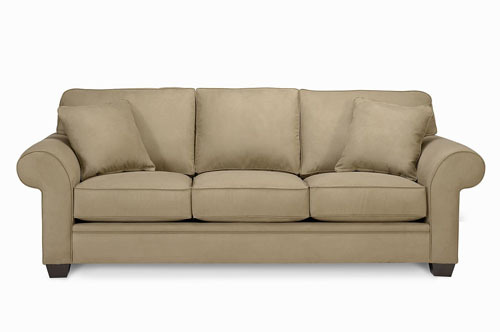 You could buy five of these for the price of one PB sectional. I should mention, one of the reasons Mr. P and I liked IKEA sofas so much was because we could move the boxes up the stairs ourselves. It wouldn’t be fun, but we could do it – I measured the boxes in-store, to ensure that the dimensions could make it into the car and up our staircase. Compared to hiring movers, an IKEA sofa is easy in, easy out. Huh? This is not a white slipcovered sectional. The smaller-profile arms are definitely more contemporary than the traditional rounded ones I usually prefer, but Mr. P likes the style. And as different as it is, I must admit that this sectional delivered something the IKEA ones did not – the open chaise that Mr. P preferred, with the “two-backs” that I like. Letting us both have our way comes with a downside, though; this isn’t symmetric. 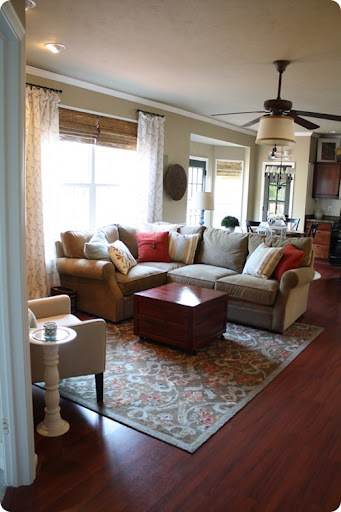 It makes me a bit nervous to buy a sectional that wouldn’t necessarily work in another room. But back to the fabric. Let’s be honest – as much as I adore the white slipcover look, do I really want to wash it? Can I handle the wrinkles, the sagging slipcover? Microfiber could save me a lot of trouble – and Mr. P found it way more comfortable. Plus, after visiting all the sofas in person, this sofa was obviously nicer quality than the IKEA sofas, but only slightly more than the 2+2. That’s right, although most of the shop’s sofas are in the $2-3k range, this one clocks in at just $1050, $1100 with delivery from the local shop. It took many months of research (in-person and online) and multiple store visits (big-box stores, specialty chain shops, and local boutiques) to help us decide which sofa was THE ONE for us. But we finally made our choice... and I’ll tell you about it tomorrow! Any guesses how we reconciled my love of white and hoping for a cheap sofa with Mr. P’s pricey taste and microfiber desire? Which would you pick? Ooooo, I am so excited for you!!! How will I be able to sleep tonight waiting for tomorrow's posting - hopefully with "installed" pix??? Yay!!! Oh. $50 for delivery? I'd pay someone $50 anyday to deliver GROCERIES up those stairs... No joke. @Helen, unfortunately, I don't still have those measurements - I'M SORRY! I remember how frustrating it was trying to find that info! However, I CAN tell you that it came in two big boxes. We thought one would fit my husband's car (a midsize Hyundai sedan) but the other box would have to be strapped to the roof to get it home. That was, admittedly, one reason we voted against it... as the nearest IKEA is five hours away. Good luck!